Well, it is time to do the seeds for the summer garden. This spring I want to grow 'something new' or 'well forgotten old'. From 'well forgotten old' annuals I chose to grow Lobelia. This is a very capricious plant, because its sprouts are tiny, they are difficult to water - they can rot. Not every year I grow own Lobelia seedlings, more often I buy them. Besides I'd like to grow my own Petunia seedlings. To tell the truth, last year I was lazy and bought already grown ones. This annual greatly simplifies the decoration of hanging baskets and flowerbeds. Petunia seeds are tiny and need (as recommended in YouTube) to plant 2-3 seeds in a pot. I decided to sow them in plastic disposable cups. 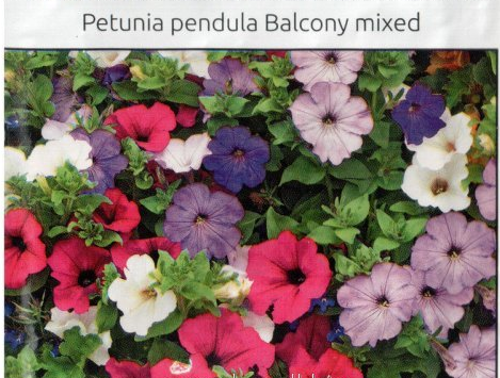 This is the Petunia 'Ampelous' variety mixture of different shades. I will have to light up all my seedlings at the evenings. I also came to a decision to grow hot peppers when I saw a packet of seeds 'Indian Spear' variety. I immediately wanted to grow these 'spears' in my greenhouse. 'Indian Spear' pepper is narrow and long, of bright red color. I hope hot peppers aren't hard in growing. 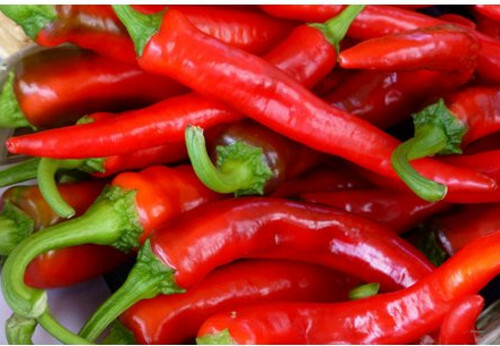 Do you have experience with hot pepper? What do you think? Flowers of Freesia brighten my home in March, because recently was one of the anniversaries of my marriage. Years fly and love patience and understanding help in life. It's good to have so many plans for the growing season ahead. I have never grown hot peppers, but it seems to be commonly done here, so I would infer that it is not difficult. Yes, it is David.Spring is time for planning. Надежда,ни разу не выращивала лобелию.Но обратила внимание на это красивое растение. Петуния часть взошла,буду еще сеять. Красивый острый перец.Выращиваю его постоянно,для домашних заготовок.Выращивать его также как и обычный перец.Но сажать нужно по-дальше от болгарского перца,иначе переопылится и будет весь перец горький. И я попробую в этом сезоне, Надежда. Перец уже взошел, помотрю какая будет рассада. I do love sweet peas Hetty. Growing plants from seeds is a great thing to do. I hope your new seedlings will bring you a lot of gardenflowers. So do I Marijke. I long for soon spring coming. Muy buena idea Nadezda. Pimientos picantes, los he sembrado varias veces y aquí se dan muy bien, primero tienes que hacer los semilleros y luego, escoger las mejores plantas. El pimiento, necesita bastante calor ¿ los vas a tener en el invernadero ? Besos. Por supuesto, Teresa. Aquí, los pimientos se cultivan en el invernadero, porque no hay suficiente calor en el campo abierto. Your first photograph of the planter is so pretty Nadezda. It's such fun to plan the garden for the upcoming season. I hope your seeds do well for you and will look forward to pictures! Lee, I do hope my plants will look well. But this depends on summer weather, seedling growing needs every day work. Thank you! I love freesias bit they never grow well for me. For me too, Sue. They need cold spring and then sudden hot summer - that is a problem in our climate. Spring is coming and with it comes the charm and beauty of flowers. I love petunias and freesias, they are flowers so colorful and delicate. I love the fragrance of freesias, Maria. It's important that they both - petunias and freesias be tolerant to rain. Beautiful flowers, Nadezda! I really like petunias. So do I, Tania and therefore I sowed petunia this year. You are a patient gardener, Nadezda. I wish you success with all of those seeds. Congratulations on your wedding anniversary. I think I'm not very patient, sometimes am lazy, buying grown seedlings. This season I decided to sow seed, let's see what the result be. Lobeliat, petuniat ja freesiat ovat kaikki hyvin kauniita. I agree, kiitos Kruunu Vuokko! I love them as well if they are rain resistant Marit. I'm afraid summer will be rainy. Freesias are wonderful flowers and since I had them in my wedding bouquet, they bring dear memories to the mind. Oh, what the memories with freesias, Sara! I love smell of freesias and the way they open their buds. I have grown chilli peppers in unheated greenhouse and they grow well, if sown well in advance. March is the right time and I also sow mine last week. With annuals I will wait for some time. Other ways they will be up too early and get leggy. Cosmos is my favourite annual I think. I plant hot pepper seedlings in unheated greenhouse as well Tistou. I hope they do well there. You're right - I'll sow annual as asters, rudbeckia later, in April. Que lindas tienes las flores amiga están preciosas. Por aquí aún es pronto para sembrar Nadezda. No tenemos invernadero y sembramos al aire. Paco empezara en abril a preparar la tierra, solemos sembrar en mayo. Sí sembramos Pimietos de Padrón, son verdes pequeños y están muy buenos fritos algunos suelen picar. Te deseo un buen martes. Laura, tienes razon, pronto es el tiempo de sembrar en tu huerto. Que bueno es Paco, hace mucho trabajo pesado, ayudandote a ti. Con pimientos no se como voy a tener, es mi primera vez. I love spring flowers. I like the composition of these purple Lobelia! Experiments in the garden are always a challenge for the gardener! I see that you have excellent ideas and challenges! Yes, I do have, Ela. But the success always depends on weather, I hope this summer is good for us. The Lobelia 'Emperor William' is a wonderful colour. A lovely post and photographs. Many congratulations on your wedding anniversary. Lovely flowers, I love petunias too, they really brighten the garden. I also sow seeds to have my plants in the garden. I shed tomatoes, celery, lettuce, peppers, asters. I'm sorry that I'm not much on blogs because I have been suffering from spine for some time. I have not yet sowed celery and lettuce - I plant to sow and grow them in the greenhouse, when snow melts. I hope you're better now. Take care working in the garden! Freesias - what beautiful scented flowers. I love them as cut flowers. I have never been quite sure what to do with aubretia in the winter. 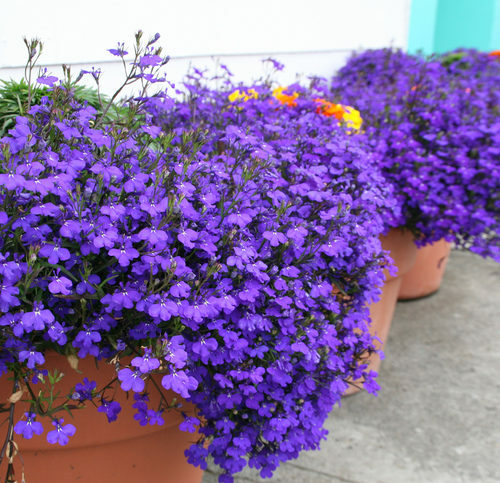 It is perennial and when left can create a carpet of purple blue. But it's so unsightly in the winter with all the dead stems. I can't seem to find out how to deal with it. I love scent of freesia as well, Jenny. And also how it opens the buds, one after another. Aubrieta is a perennial plant you're right. If you don't like how it looks in winter time you could cover Aubrieta with dry leaves, this covering will protect it from often rains that isn't good for plants in winter. I love how it looks in spring. The peppers, by the way, are beautiful looking. Lovely to grow and, for me, also good to eat, as I like hot things. I do hope harvest will be good, Jenny :-) I will do my best. The colors of freesia are full of the spring light. Agree, roughterrain crane. Thank you! I bought two very dark purple Lobelia about a month ago and put in two hanging pots. I will eventually have to move them because they don't want full sun. It's a shame I didn't see that on the tag before I bought them. Love that dark purple! I think Linda it depends on warmth, our sun isn't too hot as yours :-) I noticed Lobelia grows better in partly shady places. I advise you to place your hanging pot on east or west side of your home.